Coconut oil | Life's Conundrum - Eat to Live or Live to Eat? Having caught the casserole bug a couple of weeks ago we have been busy experimenting with different ethnic flavours (posted our take on Moroccan and Creole/Mexican casseroles in earlier blogs, links below). Tonight we tried putting together Thai ingredients to create a casserole which was not as thick as previous attempts as there are no starchy ingredients but flavour and taste wise was delicious. 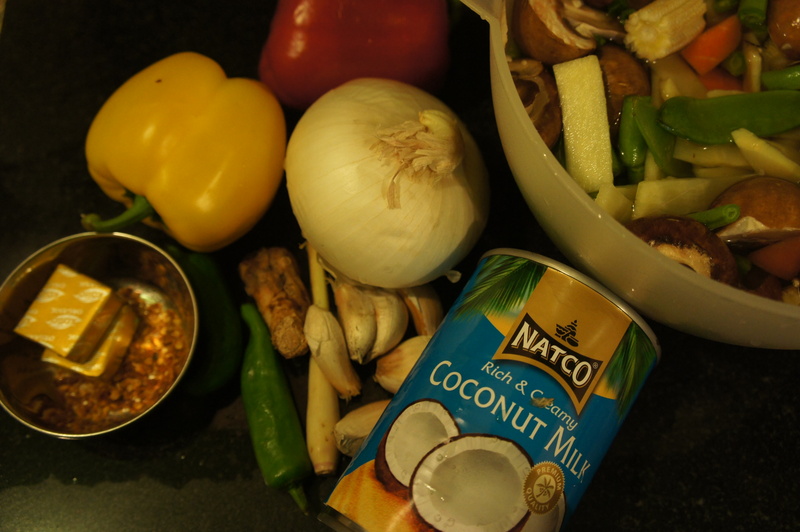 You need some standard Thai ingredients to ensure you maximize the flavour. 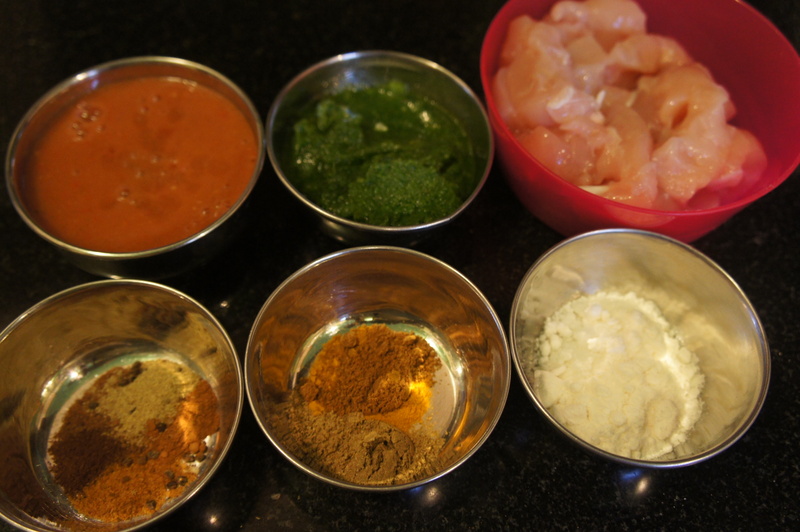 First marinade the chicken thighs with the Sriracha paste and a bit of salt – set aside for a few hours. 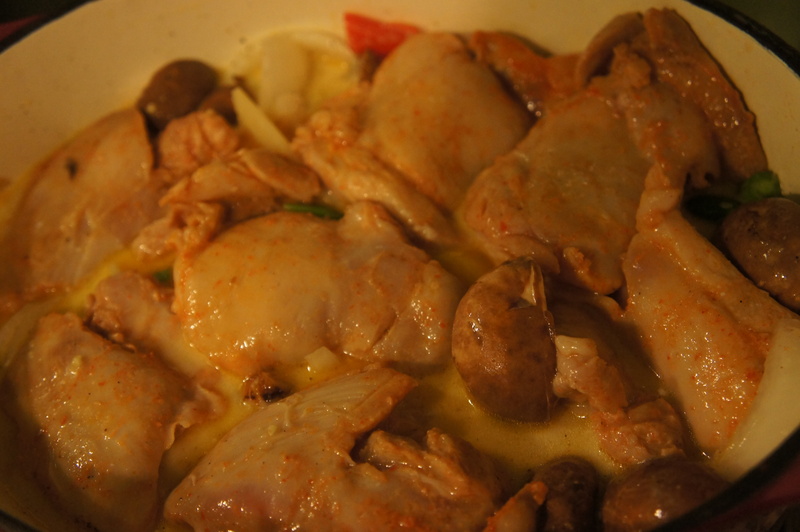 Heat your oven proof casserole dish and add 1 tbsp of coconut oil – sear the chicken pieces on both sides and remove. Add another tablespoon of coconut oil and stir the crushed birds eye chilli for 30 seconds before adding green chilli, garlic, lemon grass, galangal and kafir lime leaves and stirring for another 30 seconds. Add the onion and peppers and stir for a couple of minutes before adding the remaining vegetables, stock cubes, coconut milk, chicken and about 200 ml of water. Sprinkle a little salt and black pepper to taste and place the casserole in a pre-heated oven at 200 degree Centigrade for an hour or till the chicken is cooked through. Garnish with fresh coriander and serve on its own or with a bowl of Jasmine rice. This is the first time I have grown rhubarb chard in our garden and Shiv and I were pleasantly surprised at how beautiful it tasted. 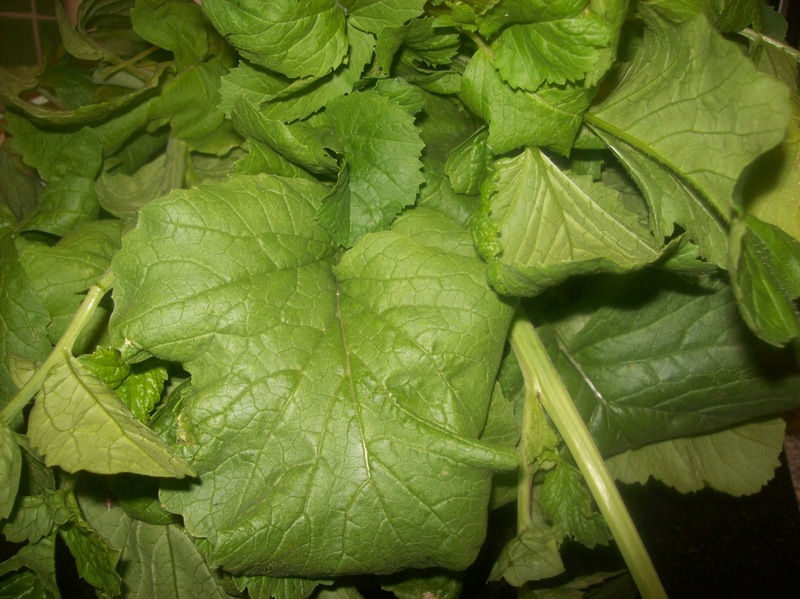 It tasted similar to Amaranth, a red spinach like leaf that is considered a super food and is grown and eaten widely in India. After the first time we cooked it, Shiv and I decided that we had a winner and rhubarb chard is going to be a regular yearly feature in our veggie patch. 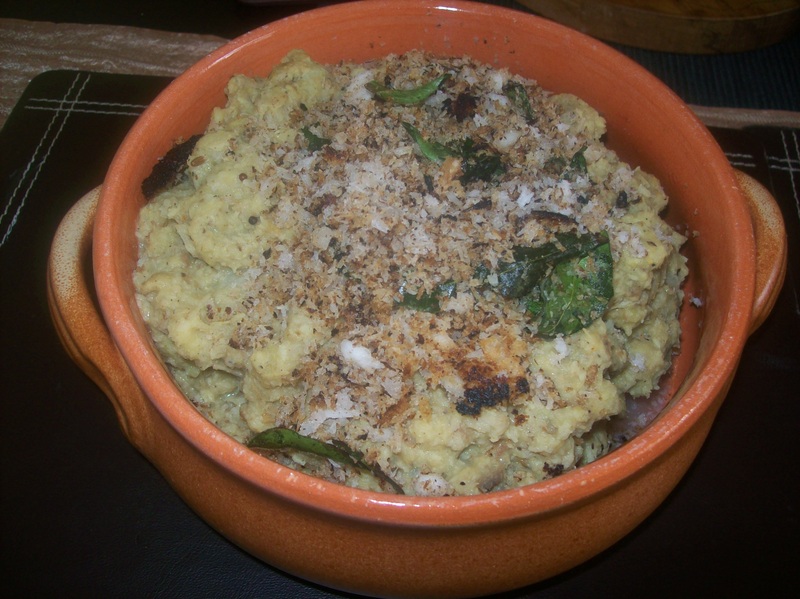 The recipe we used is normally made with amaranth and jackfruit seeds. 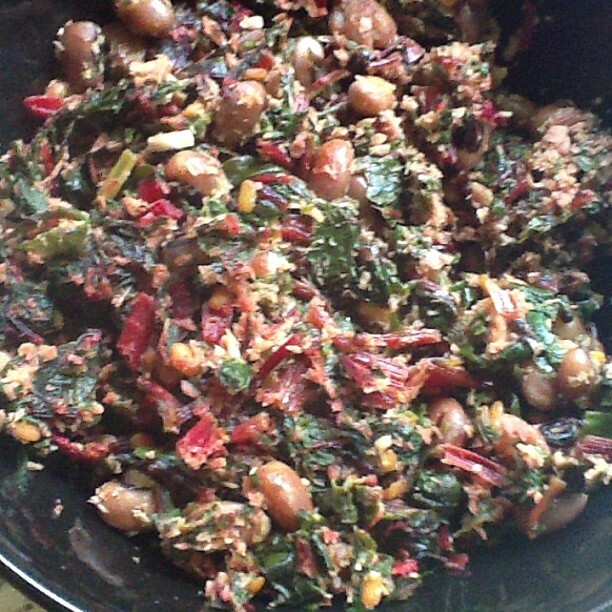 We adapted this and swapped the amaranth and jackfruit seeds with rhubarb chard and black eyed beans. 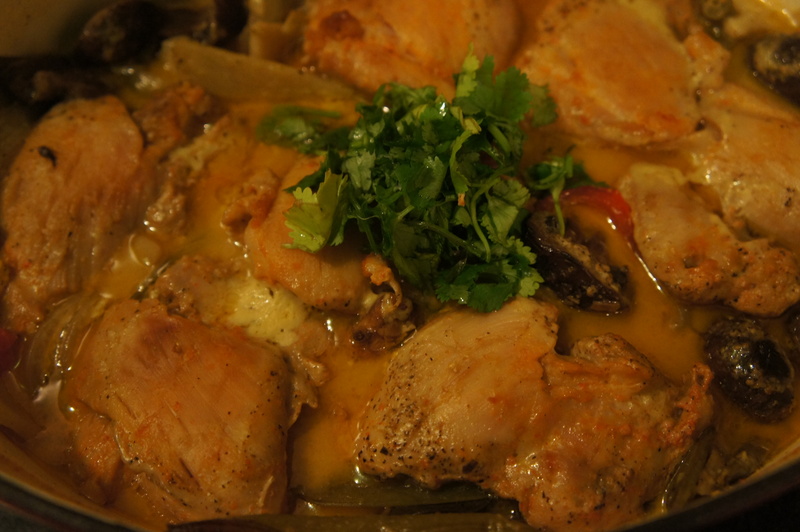 The dish was delicious and I would like to share the recipe with you. 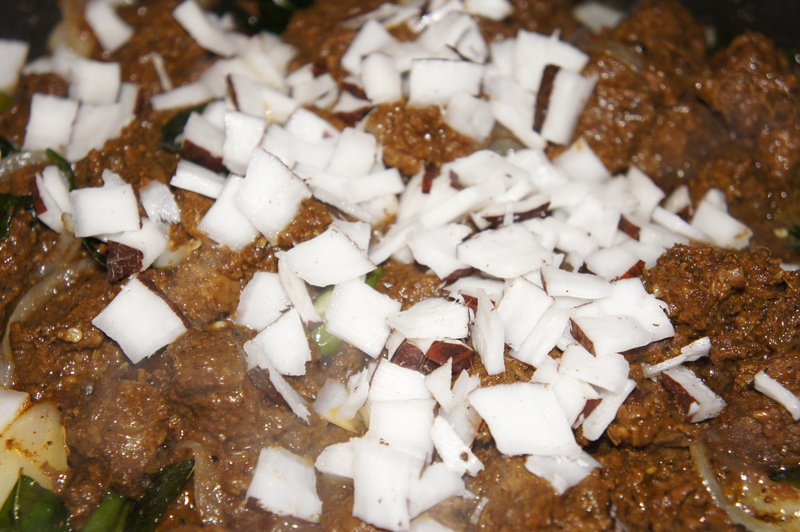 Heat coconut oil in a skillet or wok. Add the mustard seeds. When the mustard seeds splutter add the urad dhal, channa dhal and broken pieces of dried red chilli. Fry for a minute or so till the dhals are golden brown and then add the chopped rhubarb chard and the turmeric powder. 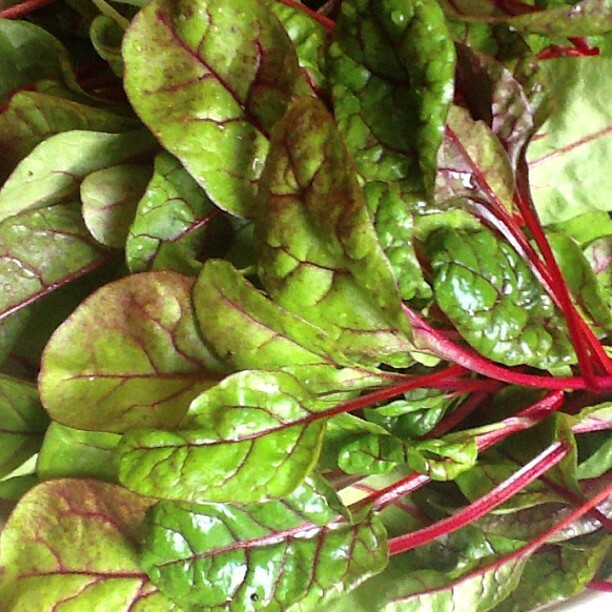 The rhubarb chard should cook in its own moisture. 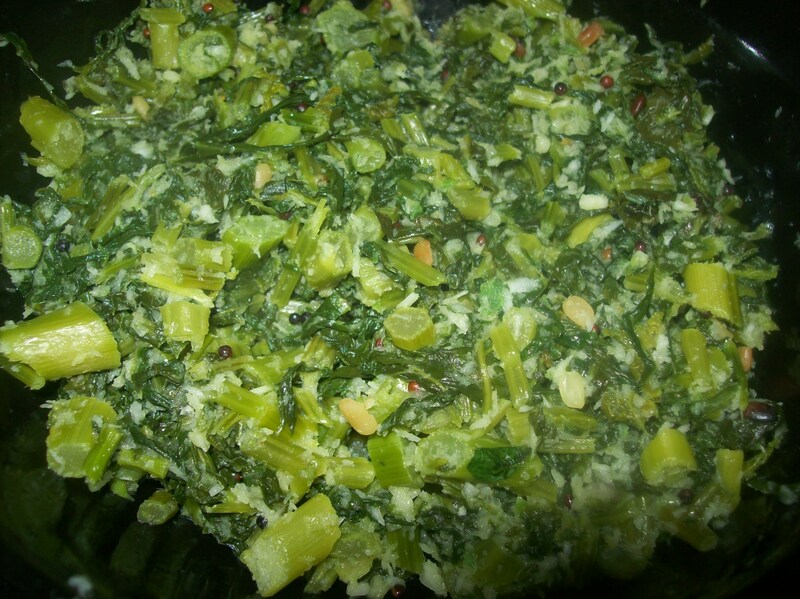 When the chard is cooked, season with salt, garnish with freshly grated coconut and remove from heat. 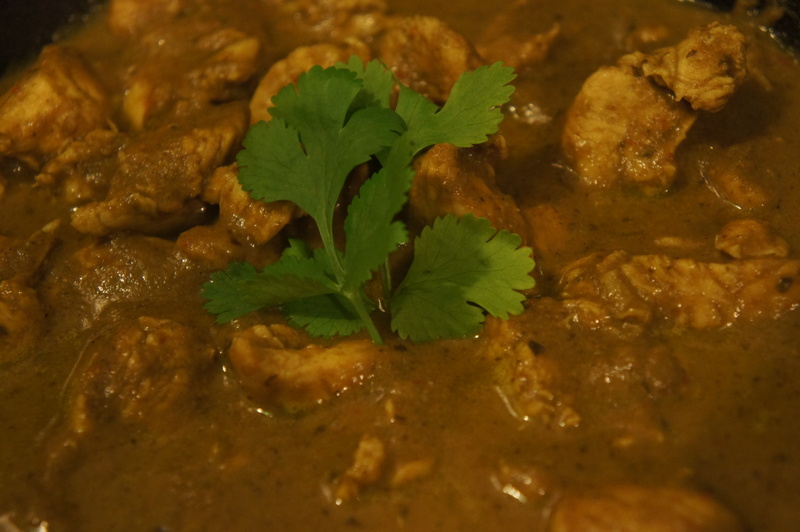 Serve hot as a side with rice or roti of choice. 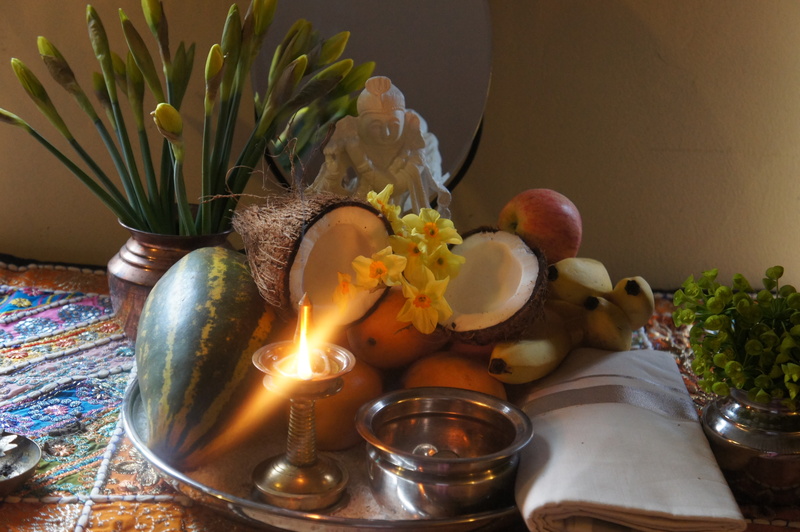 One of my best friends from school Simeen, who subsists on a largely non vegetarian diet has been hankering for South Indian vegetarian food these days and keeps pestering me for some of my vegetarian recipes. She lives in Scotland and is an avid follower of our blog. I have promised her that I would post lots of our family favourites so that she can cook them herself. This one is for her. 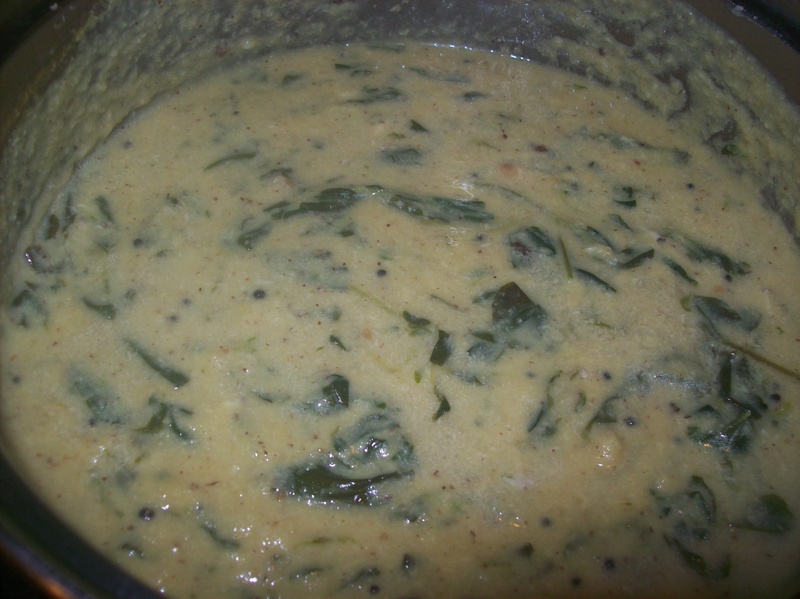 Though I have made this with fenugreek leaves from our garden, it can be substituted with any spinach. 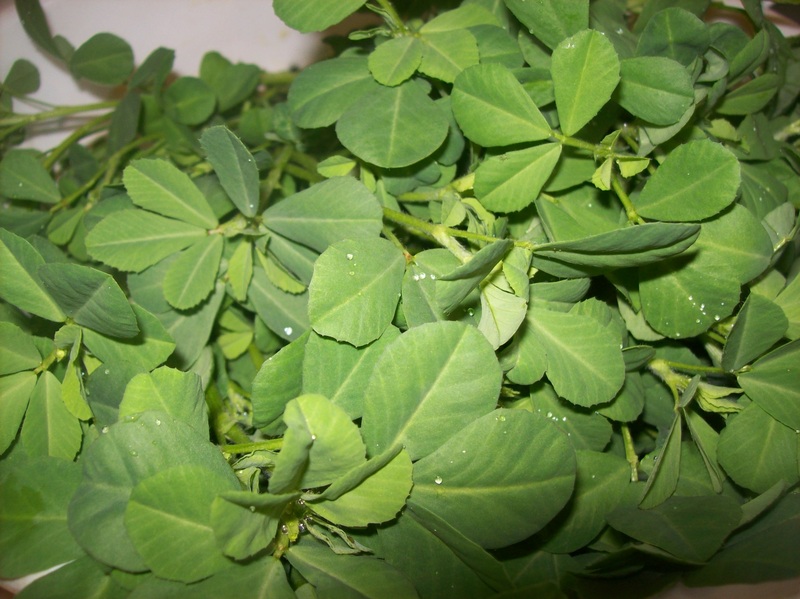 fenugreek or methi as it is popularly known is widely available with most Asian green grocers in the UK. 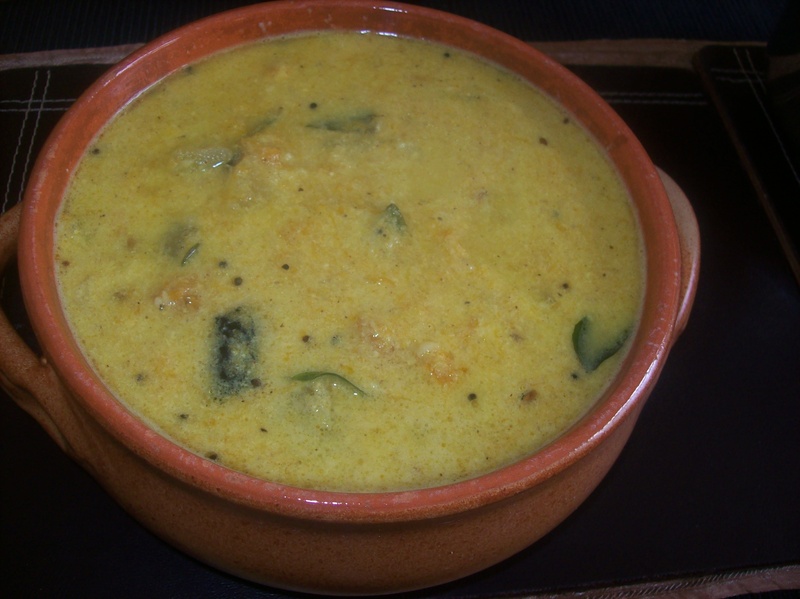 Roast the urad dhal and the dried red chillies in a little bit of coconut oil till the urad dhal is golden brown. Add this to the coconut and cumin seeds a little bit of water and grind to a fine paste. Set this paste aside. In a heavy bottomed vessel boil the methi leaves with water, salt and a pinch of ground turmeric. 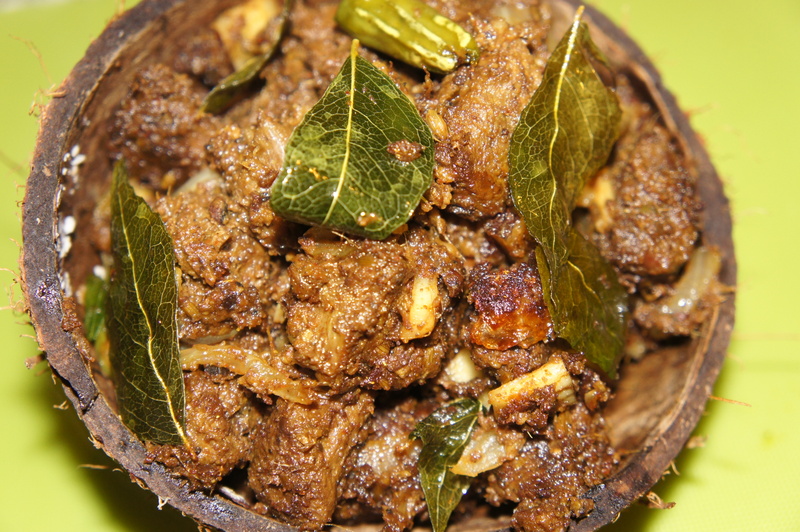 When the leaves are cooked, add the cooked dhal and the coconut paste. Mix well and let it come to a boil. Simmer gently for about ten minutes and adjust seasoning. Now for the tempering, in a skillet heat the remaining coconut oil and add the mustard seeds. 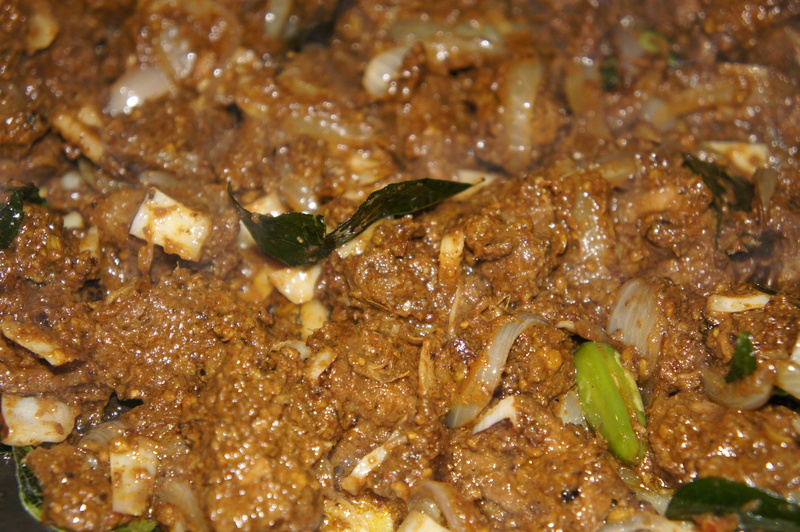 When the mustard begins to splutter, add the curry leaves and take it off the flame. 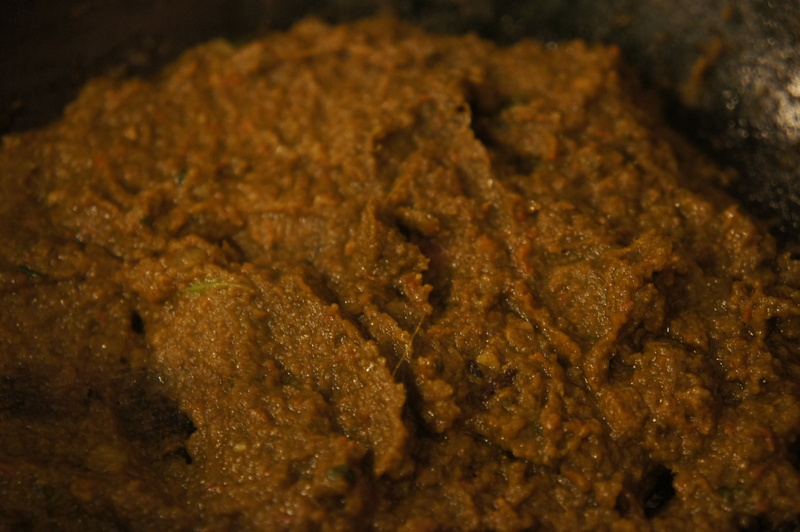 Add the tempering to the methi and dhal mixture. Give it one final stir before taking off the flame. Serve hot with rice.